I am now back to work full time (until I go on maternity leave in 9 weeks). As many of you know, my husband is a farmer, so he generally gets home fairly late between 7-7:30. I like to have supper ready to go when he gets home. I get off work, pick up our daughter at daycare, come home, clean out our bags from that day and ready them for the next day, pick out clothes for the next day, etc. In that same time I need to be thinking about supper and/or getting supper ready. I love meals that are quick and easy to make, don’t have too many ingredients and are ‘one pot’ so I don’t have to spend a lot of time on clean-up. This recipe checks all of those boxes! 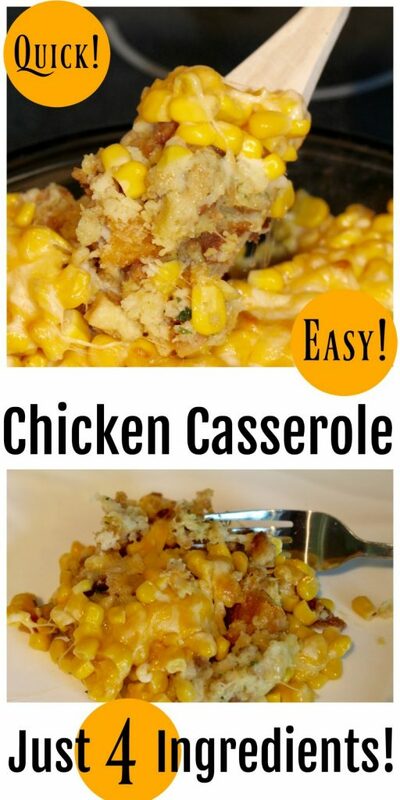 This Quick & Easy 4-Ingredient Chicken Casserole is made with Frozen Chicken Tenders, Stuffing, Corn & Shredded Cheese. It seriously couldn’t be simpler. Including time to pre-heat the oven it only takes about 25 minutes from start to finish. Step 1: Preheat oven to 425 degrees. Step 2: Prepare stuffing according to directions on the box if using boxed stuffing mix. This recipe is really good for using up Thanksgiving leftovers as well! Step 3: Spray 1.5 quart glass baking dish with non-stick spray. Step 4: Add frozen chicken tenders to the bottom of the casserole dish. Step 5: Add completed stuffing over the top of the chicken and pat down with a spatula. 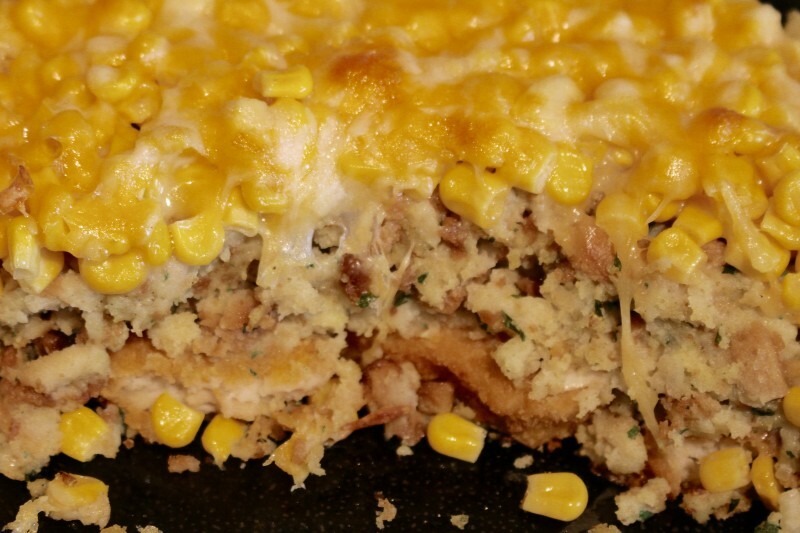 Step 6: Drain corn & sprinkle over the top of the stuffing mix. 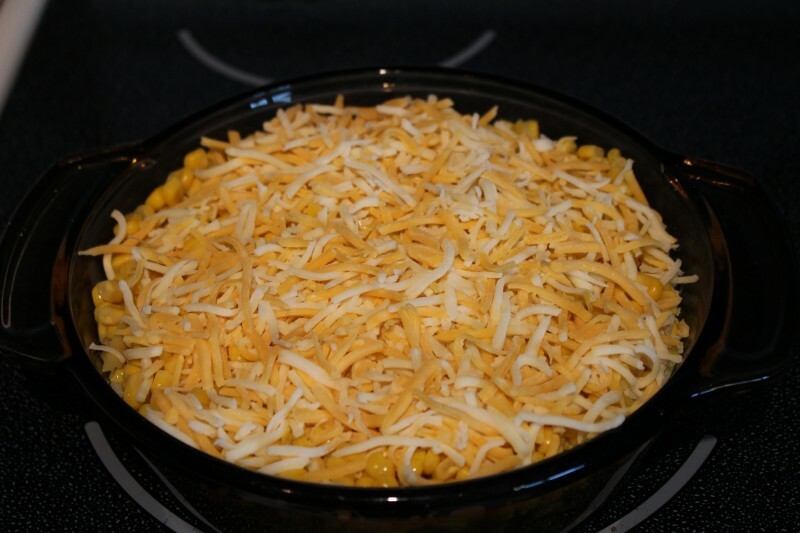 Step 7: Sprinkle shredded cheese over top of corn. Step 8: Bake at 425 for 15 minutes. Step 9: Enjoy! Salt & pepper to taste. This meal is a favorite in our house! What do you think? Is it something you might try? Feel free to pin this recipe on Pinterest to save it for later! Come back & let me know what you think if you try it! This post currently has 41 responses. I think this looks yummy and very easy to make. I will make this for a gathering coming up. This is so easy. The girls will love to make it for us. Thank you for the recipe. 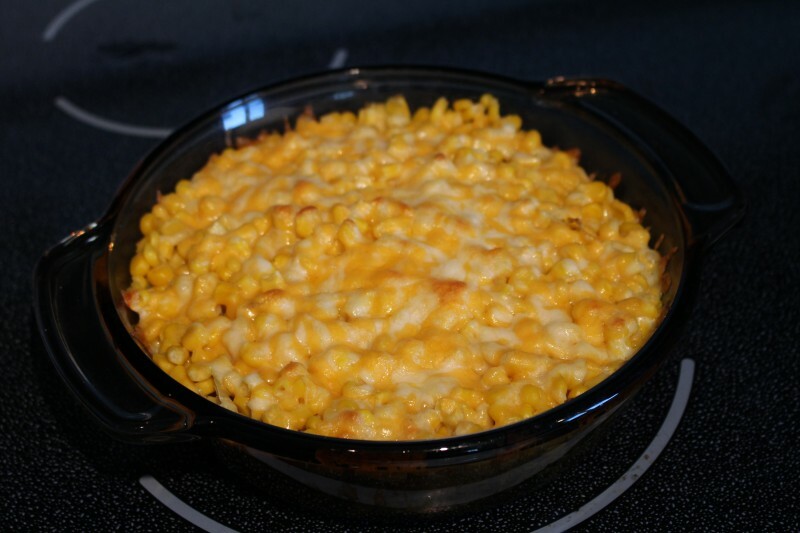 Years ago I lived in Minnesota and this recipe reminds me of a recipe called Minnesota Hot dish. Your recipe sounds easy and delicious at the same time. This is definitely a super quick and easy meal, and it sounds pretty good! I personally have never found a brand of frozen chicken nuggets that I like, but my kids love them! So I know that they would love this dish and I will definitely be making it for them soon. Thanks for sharing! 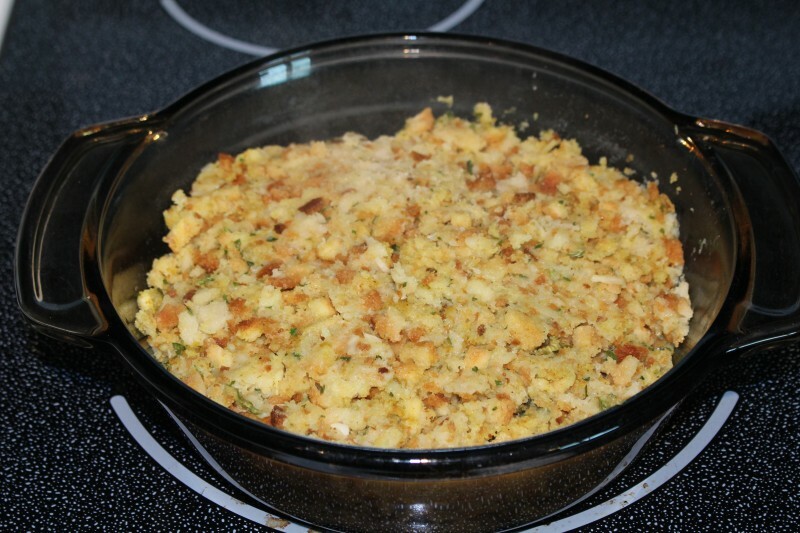 Get rid of the regular bed stuffing and make it cornbread stuffing and this is PERFECT! It has all my favorite foods together, so YES I will be making this very soon! That is quick and easy. I like the ingredients (would add some garlic). Ideal for the kids. 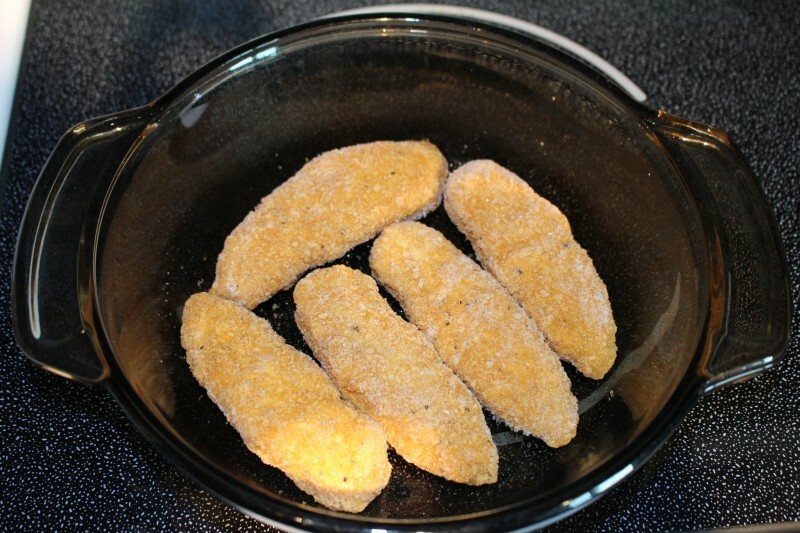 They like chicken tenders and nuggets so this would be a quick easy meal to make them. I think I would try this one. I make something kind of close to this . I also make another really similar only I use minute rice mixed with a can of soup (usually cream of mushroom) where the dressing is and use whatever vegetable on hand. I too am one of those ‘one pot’ gals! Meal do not have to have a million things in them to be great. This looks good. I’m always looking for new recipes using chicken! This sounds so easy & yummy, thanks for sharing. This is similar to the tuna casserole I grew up on, but definitely the chicken is a great enhancement! I make something similar to this but its called Chicken Mecican Ranch, its made with Tortilla shells bacon and ALOT of cheese. My kids loved it. This looks so good, and looks easy and fast. That’s my kind of meals. My husband loves chicken casserole. I love to change up ingredients so we can explore different combinations in our dish. 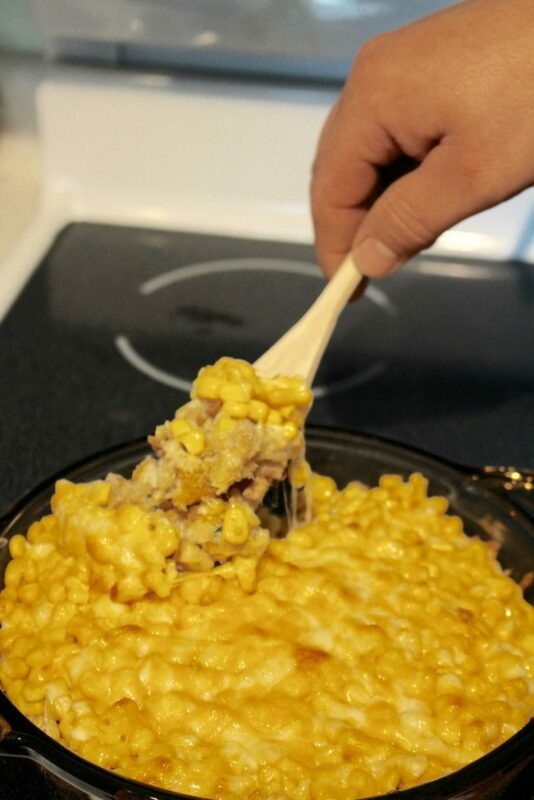 I would have never used corn in my recipe but this looks delicious. 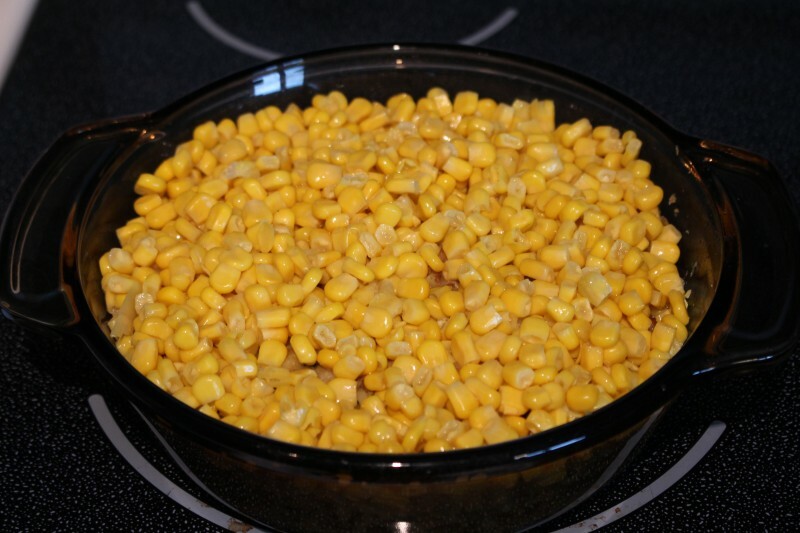 We love corn so we may give this recipe a try. Thanks for sharing. Looks so yummy! 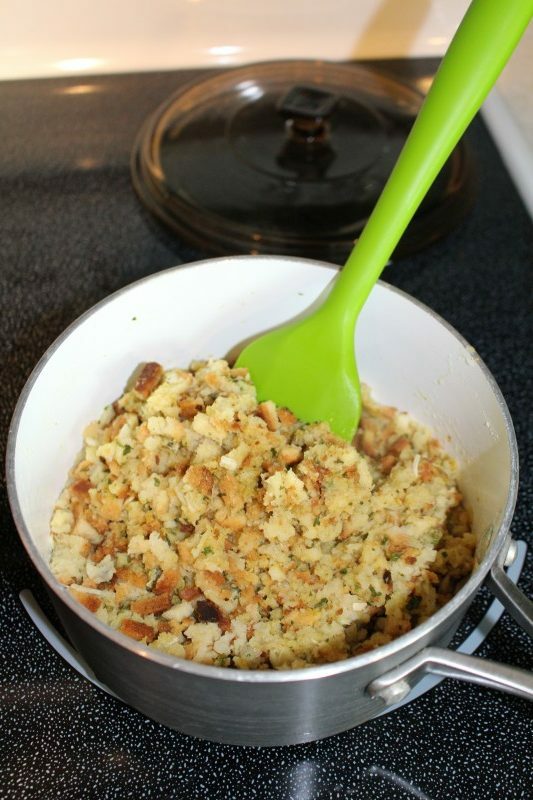 I could eat stuffing all day everyday, it’s so amazing! And what a perfect dinner because I have all of these in my pantry now. Oh, I was searching for crockpot recipes, and this is a nice one! I’d love to try it! Tasty and easy! This sounds so simply and great for the grandchildren. So gonna try this with Thanksgiving day left overs. I love this recipe! It only has 4 ingredients and looks very filling. 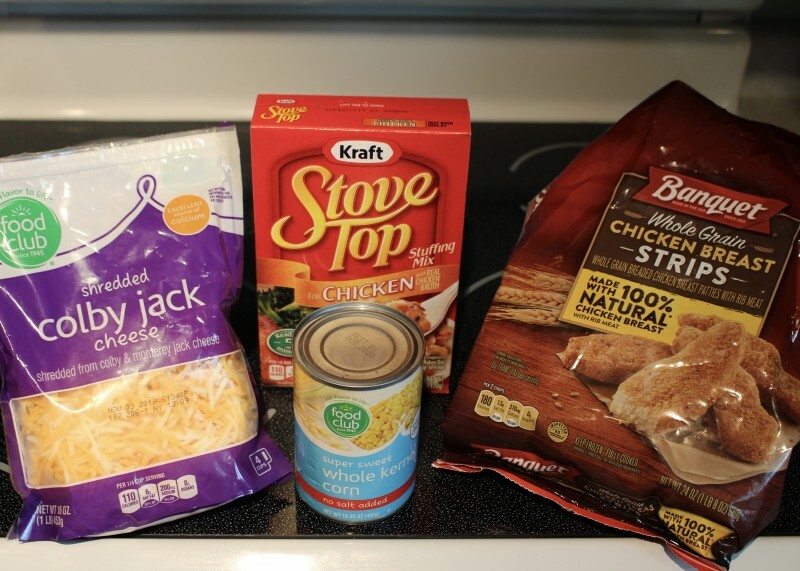 Perfect for comfort food on cold winter nights. Thanks, Emily for the recipe! This is a great idea for using chicken as I am always trying to find new recipes. I will have to pin this for future use. 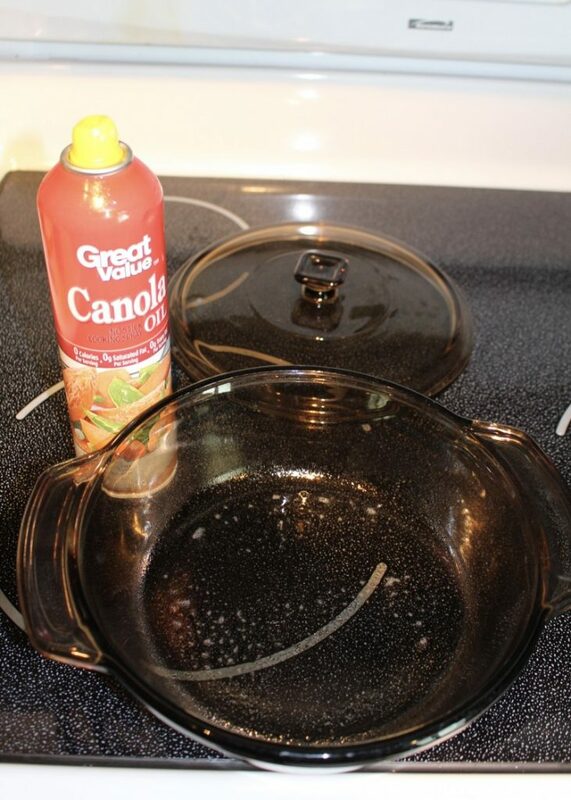 I love this quick and easy recipe. I sure will try this. This looks very good & easy. I will try the recipe. My son would like this one. Thanks for posting the recipe. This loos like something i need t try, easy, quick, and ingredients my children would actually eat. they are so picky! II love how quick and easy this seems. I am not a big stuffing fan but everyone else in my house is. I think I may like it made into something this way. This is awesome. We always have so much left over chicken so this is going to be great to make. The family will love this.. This looks delicious! I love quick & easy recipes! I like this kind of recipe. It’s fairly quick and easy but still delicious. Chicken is our favorite meat. I am always looking for new recipes. Quick, all the more reason I like this recipe. It sounds delicious. My mom used to make Chicken Casserole. This recipe seems very tasty and easy to make, I like that! This looks like a really easy recipe for a busy night. We always need a meal during the week that comes together quickly. This looks delicious and so easy to make as well! Four of my favorite foods in one dish! Thanks for this fantastic recipe. I will be making this this weekend.